The ancient Egyptians had an elaborate medical system that was initially built on magical traditions, but later became more scientific. The Edwin Smith Papyrus (3000 B.C.) 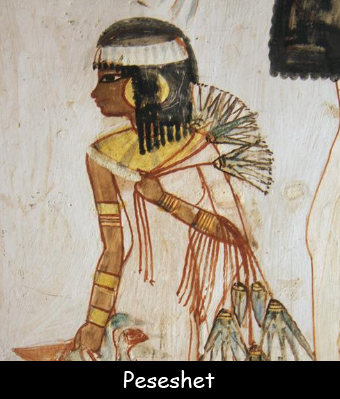 and the Kahun Gynecological Papyrus (1800 B.C.) are two of the oldest known medical books. Peseshet was the first known woman doctor. She oversaw a school for women midwives in addition to her duties as a doctor. The Greeks also had an advanced medical system. Doctors today still agree to follow the Hippocratic Oath, developed by Hippocrates, a doctor in ancient Greece. The Hippocratic Oath says that a doctor will first do no harm to a patient. In Babylonia, early doctors were also skilled at diagnosing illness and providing treatments, usually in the forms of herbal medicines. The Babylonians used logical rules and reasoning in their observations of the human body. Ayurveda, meaning “the complete knowledge for a long life” began in ancient India. Doctors there believed that the human body contains all the elements — fire, water, earth, and air. When these elements became imbalanced, ill health followed. Modern Chinese medicine, which still relies on acupuncture and herbal remedies, developed thousands of years ago. During the Middle Ages, medicine in Europe was rather primitive. Doctors believed illness was caused by foul air or bad blood. Doctors placed leeches on people to remove some of their blood. Unfortunately, this treatment, which continued for several hundred years, often caused more harm than good. The Renaissance marked a time of increased learning. Medical schools in Italy trained doctors and nurses. Catholic hospitals treated the poor. From the 1600s to the early 1800s, medical care progressed slowly. In Britain, few trained doctors existed. Instead, amateurs who understood how to use herbs provided care. There were also charlatans, people who pretended to be doctors to get money. During the 1800s, several doctors introduced the idea of germ theory. Microscopes allowed them to study bacteria like never before. Doctors began to understand that illness is often caused by germs, not from a lack of balance or from bad air. This advancement changed everything. Today, modern medicine combines previous knowledge with new learning. Doctors consider herbal treatments, when appropriate, but can also use cutting edge equipment and medicine to heal patients. Watch a video about the history of medicine.